The shoulder joint is the most mobile joint in the human body, allowing for a wide variety of movement – flexion (arms overhead), extension (arms moving toward the back), abduction (arms out to the side), adduction (arms pulled into the mid-body), protraction (shoulders rounded forward), retraction (shoulder blades pulled in), external rotation (arms with the elbow creases pointed outward), internal rotation (elbow crease turned inward), elevation (shoulders up toward ears), depression (shoulders pulled down) and circumduction (arms rotating around in the socket). But most of us tend to have some kind of restriction or imbalance in our shoulder area, primarily from sitting hunched over electronic devices, carrying heavy shoulder bags, sleeping on our sides, or relying predominantly on our dominant arm to do most of our daily activities. So how can we counteract some of the shoulder tightness that can arise from modern daily activities? My go-to solution is yin yoga. If you’re not familiar with yin, it’s a practice of static poses held for typically 3-5 minutes to allow the fascia and other connective tissue to become more supple. Fascia is the network of web-like collagen that surrounds and gives structure to our muscles and even our organs. The long holds, with muscles relaxed, allow for the tissues to be compressed and stressed, in a good way, ultimately leading to better lymphatic and blood flow to the affected area. This sequence is designed to take your shoulders into all directions and, over time, can improve your range of motion and balance in your shoulders. You’ll need two yoga blocks, a bolster (or a blanket roll or seat cushion}, and a blanket. Start in tadasana and warm the shoulders up with 5 slow shoulder rolls both front and back. Clasp your hands together, fingers woven to the webbing, turn your palms away from you and straighten your arms out in front of you at chest level. Raise your straight arms overhead on a slow inhale. Lower back to chest level on a slow exhale. Lower the arms and then move them behind you, palms clasped together, arms straight, as far away from your back as you can, pulling your shoulder blades together. Bring the arms back to rest at your side. Redo the hand clasp with the opposite thumb on top and repeat the whole sequence – arms forward and up, down and behind and then back to neutral. Repeat again with both hand clasps. Now for the yin practice! 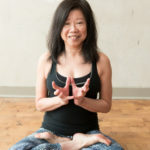 Try to hold each yin pose for 3 minutes to start and work up to 4-5 minutes as you become more familiar with the poses. Use the timer on your phone or a kitchen timer. Keep in mind that you’ll be holding the pose for a while, so don’t move to your edge right away. Relax your muscles in each pose; resist the urge to push and allow gravity to do its thing. Remember to breathe deeply into your tight spots. Add a blanket support for your head whenever needed. Lie face down on your mat. Take your blocks and place one under each shoulder at medium height, so that the whole front of your shoulders rest comfortably on the blocks and your torso can sink in between the blocks. Place your arms in goal-post position, forearms sinking toward the mat, and release your head and chest toward the mat. Hold for 3 minutes. If your body feels ready for even more opening, move the blocks to the highest setting, move your hands and place them wide on the mat on the outer edges of the blocks to accommodate the new block height. Place a blanket under your forehead if it doesn’t reach the mat. Again, sink the chest and relax your head. Hold for 3 minutes. Remove the blocks and lie back down on your belly in sphinx pose (forearms down and parallel to the long side of your mat, elbows under your shoulders, sternum forward). Hold for 5 breaths and then start to cross your arms under your chest and straighten them out in opposite directions, as you place your chest on top of them. Relax your head. The more you extend your arms, the greater the stretch. (If you’re endowed with an ample chest, this pose could remind you of the compression you feel during a mammogram!) After holding for 3 minutes, re-cross your arms with the opposite arm on top, rest your chest down and hold again. If you find this pose excruciating, try placing only one arm at a time under your body (the other arm alongside your body) and do each side independently. Take the blocks and place them at the lowest setting, short ends toward the top of the mat, with the front edges angled in slightly, about shoulder width apart. Move into tabletop with hands on the blocks and knees on the mat under the hips. Keeping your hips over your knees, place your elbows and upper arms onto the blocks where your hands were. Sink your chest toward the mat. After 2 or 3 full slow breaths, bring your hands into prayer position, upper arms still on the blocks and start to bend your arms, moving your hands back toward the nape of your neck. Relax your head and chest toward the mat and hold for 3 minutes. Release into child’s pose for 2 breaths. Lie back down on the mat, face down, then roll onto your left side. Take your right arm and rotate it inward so that your palm faces back. Bend the arm behind your back, moving the hand up your back as far as it will go (top of the hand touching your back). Keep the bent arm in place and roll onto your back over the arm. Let your back rest heavily on the bent arm and use the pressure to open up the upper arm and shoulder area. After 3 minutes, repeat on the left side. Roll back onto your belly, placing a blanket under your head for light support. Take your arms out to the side in a T. Roll slowly onto your right side, keeping the right arm straight and as close to shoulder level as possible, palm facing down. If the stretch feels too intense, angle the arm toward your waist as needed. Bend your left leg and place the foot on the ground behind your right knee to provide stability. Bend your left arm and rest the hand on the mat by your belly or behind your back. Hold for 3 minutes and repeat on the opposite side. Savasana is almost here! Lie on your back with 1 block under the bottom of your shoulder blades at the medium setting, 1 block under your head also at medium height, and a bolster (or blanket roll or seat cushion) behind this second block. Take your arms overhead and hold your bent elbows. Adjust the bolster (or other support) so that your arms rest comfortably on it. Cross your legs at your shins and relax your knees down toward the mat (sukhasana legs). Hold for 3 minutes and then repeat with the opposite arm and leg on top. Remove the props and take a much deserved savasana! Place the bolster under your knees to release the low back, if it feels good, or place the folded blanket over your pelvis for extra grounding. This practice is meant to be deeply meditative, so really let yourself feel the postures. You can’t run away from yourself in a yin pose — there’s nowhere else to go but inward. Relish the quiet state of mind you’ve achieved on the mat and maintain this calm for as long as you can after the practice. Become open to the moment (as you open your shoulders! ).